A few weeks ago, when my good chum Aaron and I were staring down a plate of serious BBQ at Bludsow’s in Compton, one of the regulars told us that his favourite place for soul food in L.A was Carolyn’s Kitchen, a short distance away in South Central. Neither of us had heard of it, but both nodded politely and made a note to give it a try the next time a bit of down home food sounded good to us. That day came around sooner than we both expected and at noon today, Aaron picked me up and pointed his car down the 110 towards our destination in one of the more notorious parts of Los Angeles. I am certain that the neighbourhood in which Carolyn’s Kitchen is situated is not one that I would want to spend a great deal of time in after dark, but as we pulled into the parking lot in broad daylight, the area looked benign enough. 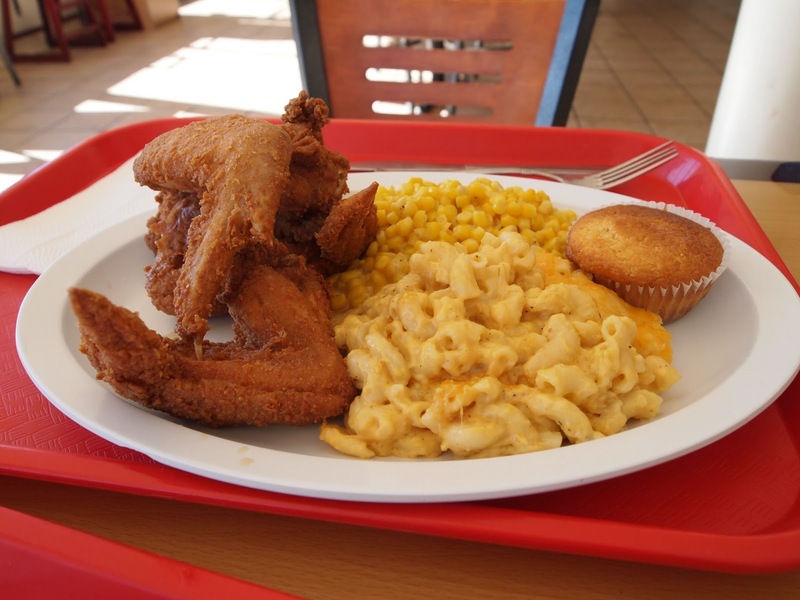 Like most of the best Soul Food restaurants I have visited in the US, the food at Carolyn’s Kitchen was served canteen style, the dishes sitting in trays waiting to be decanted into polystyrene containers for take out or plates for eating in on the few dining tables available. The menu is small and we were told that we would have to wait fifteen minutes if we wanted fried chicken as it was cooked fresh to order. We are both suckers from deep fried anything, so agreed to share a portion of that and then popped outside to have a look at the one menu on offer, posted on the window, before deciding on the rest of our meal. By the time they called out that our chicken was ready, we had already agreed to supplement it with an order of slow cooked beef short ribs and sides of mac & cheese, sweet potatoes, green beans and creamed corn. The guy behind the counter piled them high on the plate next to our main protein and then popped a fresh warm biscuit on the side of each order just for good measure. There is nothing fancy about the Soul Food in general, but when well prepared it is the sort of food that can make me very happy. I am delighted to report that Carolyn’s Kitchen makes really rather good Soul Food indeed. The meat, which was covered in a rich gravy, fell from the bones of the beef ribs with one prod of a fork, the sweet potatoes were creamy and delicious and even the mac & cheese whose attraction to others is normally a mystery to me, was not half bad. Star of the show, unsurprisingly was the freshly fried chicken which had a wonderfully crunchy coating and moist flesh juicy enough for us to both require a good washing of the hands and face as soon as we had finished our meal. With a couple of soft drinks, our bill came to $27, and left us so full that we could not bring ourselves to order the slabs of butter cake covered in caramelized butter icing that had just been put on show as we went up to pay for our meal. I guess we will just have to give it a try next time we both decide that we need a bit of Soul Food in South Central.